Dr. Fu's research focuses on protein-protein interactions in signal transduction, targeting these interactions for drug discovery, and collaborating with physician scientists to translate such bench research to clinical applications. 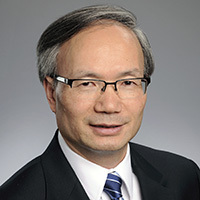 Haian Fu, PhD, is Professor and Chair of the Department of Pharmacology and Chemical Biology at Emory University School of Medicine. Dr. Fu also serves as the Director of the Emory Chemical Biology Discovery Center and Leader of the Discovery and Developmental Therapeutics Research Program at Winship Cancer Institute of Emory University. Dr. Fu serves on two national steering committees in the US, the National Cancer Institute's Chemical Biology Consortium Steering Committee (2009-2015) and the NCI Cancer Target Discovery & Development Network Steering Committee (2012-2017). Dr. Fu served as the President of the International Chemical Biology Society (2012-2013). Dr. Fu earned his PhD in biochemistry at the University of Wisconsin-Madison in Madison, WI. He completed a fellowship in microbiology and molecular genetics at Harvard Medical School. ﻿Dr. Fu's research focuses on protein-protein interactions in signal transduction, targeting these interactions for drug discovery, and collaborating with physician scientists to translate such bench research to clinical applications. Beside publishing original research in prestigious journals, Dr. Fu edited the widely-circulated books on Protein-Protein Interactions (2004) and Chemical Genomics (2012) and serves as Associate Editor for “Molecular Pharmacology”. He served on various national and international review panels, including NIH study sections, the NIH site visit team for NCI laboratories, Chinese Academy of Sciences site visit team, UK Cancer Research review panel, and Canadian Genomics Review Panel.